Hands up if you’ve never been infected by stories of post-apocalyptic survivalism or zombies. Surely most of us have read or watched a high- or lower-brow version, from Cormac McCarthy to The Walking Dead. (BBC’s Survivors, 1975, anyone?) Yet, familiar as these cultural tropes have become, Ling Ma approaches them afresh in her debut novel. Hers is a chilly story of alienation and foreignness, as experienced by twenty-something Candace Chen, whose parents’ migration from China to Utah when she was a child has left her emotionally stranded and alone. So, when the Shen Fever strikes, wiping out the entire US – and possibly world – populations, excepting a handful, adult Candace feels scarcely less detached than she did before, when living a desultory millennial life in New York City. 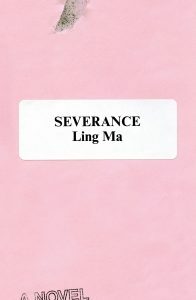 Ma’s vivid prose does a fine job of evoking Candace’s remote point-of-view, whether before or after cataclysm: a visit to her family in Fuzhou; a business trip to Asia, to visit Chinese printers, where Candace’s rusty language skills and ‘other’ life experience inhibit communication; glimpses of childhood, showing her stranded between an engaged father and a punitively unhappy mother; early adult years in Brooklyn, with friends and lovers and 80s-themed dinner parties; and then the slow, creeping effects of mass mortality. At all of these stages, Candace is both a participant and an observer, later a photographer too, for whom the camera lens acts as a metaphor for another degree of separation. As one of the few survivors of the epidemic, Candace, all but alone in New York City, finally leaves town to join forces with a disparate group traveling towards a safe house near Chicago, often raiding passing homes – a process called ‘stalking’ – in search of food, clothes and other essentials. This process sometimes turns up fever victims who haven’t died but are instead trapped in repetitive routines – laying tables, folding clothes – their mindless activities reminiscent of the workers Candace encountered at the demanding printing works she would visit on business overseas. Ma has referred to her book as ‘an apocalyptic office novel’ and its critique of capitalism, done slyly yet tellingly, is a central ingredient in her fusion of narrative themes. There’s suspense in the gothic, survivalist scenes, complete with twitching, maggot-infested corpses. There’s contemplative analysis in Candace’s musing on the oddities of her world and her place in it. There’s a battle of wills, between our steely heroine and the autocratic leader of the survivors. And there’s the sardonic take on routine, work, wage slavery and consumerism. All of it adds up to a remarkable package, thought-provoking and compelling, as it ricochets between the familiar and the unexpected. Most memorable, though, are the scenes of New York, emptying invisibly as its population migrates or fades away. Empty stores, echoing streets, flooded subway tunnels. Candace records them for her photo blog, called NY Ghost, and as the internet flickers and falters, so does a monumental, scooped-out version of modernity. We say goodbye to Candace in another city, equally ruined, in which she is alone again – or maybe not – and on the run, heading to a destiny of her own making. Will she survive, this oddly equipped loner in a stripped down world? Who knows. But we do know we will miss her.